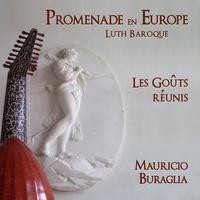 Mauricio Buraglia : Promenade en Europe Luth Baroque. The Promenade of the Baroque lute comes from a very specific genre of music. We have Italian or Spanish music composed for this instrument between the late 17th century and the beginning of 18th. The baroque lute had a new tuning developed by the school of French lutenists, which was adopted by Germany, Flanders and the Eastern European countries in particular. The influence of the French court of Louis XIV on northern part of Europe is undisputed. The French school of lutenists were traveling through the courts and salons of Europe, publishing material and giving concerts. Their advice was sought throughout Europe. However, Italy and Spain were not interested in the this new tuning of the lute, they kept their older tunings, which lead them to the violin, the opera orchestra and singing. Italy in turn influenced European music at the beginning of the 18th century with the opera concerto, arias of divas and castrati and impresarios. The music of the lute, has a massive and rich past and came to maturity during this time both in terms of the music and instrument building ("lutherie"), this in turn caused a great interest in the lute from interpreters, composers and the public. The popularity of the lute is visible in the repertoire: solos, chamber music, and lute concertos start to appear and the virtuosity and genius of the interpretations are at their historical peak during this period. It is in this environment that the different styles and tastes reunite and create a new fashion which comes to be known as the "galant style" of lute playing. I Cavalieri del Liuto - The Knights of the Lute by Paul Beier: solo lute of the Italian renaissance.